INTACT™ ADVANCED is a next generation guar-based drift reduction agent from Precision Laboratories. It is a convenient, low-use-rate premix that is great for the grower-applied market. INTACT ADVANCED will minimize off-target movement, maximize foliar droplet retention, and condition hard water without the use of AMS. 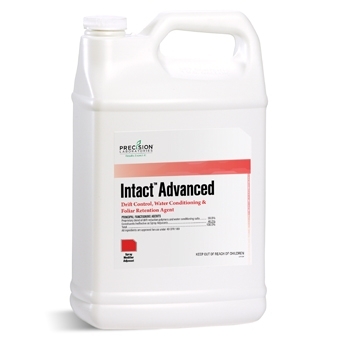 INTACT ADVANCED is specifically formulated for use with glyphosate and dicamba and will not spike dicamba volatility.